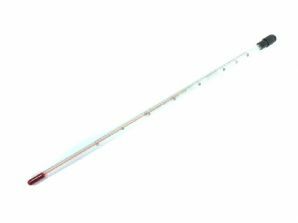 The Ag general purpose 12" glass thermometer is an excellent tool for any darkroom, featuring a useful scale with 0.5°C increments, which means it is possible to use for colour work as well as black & white. Scale runs from -10°C to +50°C. Red capillary. Ideal for use with developing tanks as it is slim enough to reach right into the tank. Made in the UK. This is an ideal alternative to the Paterson thermometers.